WRKY transcription factors are one of the largest families of transcriptional regulators in plants and form integral parts of signalling webs that modulate many plant processes. Over the last ten years, several excellent reviews on WRKY transcription factors have appeared (Eulgem et al., 2000; Ulker and Somssich, 2004; Zhang and Wang, 2005; Eulgem and Somssich, 2007; Rushton et al., 2010). The first review by Eulgem, Rushton, Robatzek and Sommsich (2000) established a number of important concepts concerning these transcription factors. More recently, Rushton, Somssich, Ringler and Shen (2010) presented an update of the latest findings and insights in WRKY world. Below is a short overview of what is currently known concerning WRKY transcription factors. Figure 1. Amino acid sequences of the WRKY domain. Red indicates the WRKY signature and blue the residues of the zinc finger that coordinate a zinc ion. The first two reports of WRKY transcription factors appeared 15 years ago and were of ill-defined DNA binding proteins that played potential roles in the regulation of gene expression by sucrose (SPF1) or during germination (ABF1 and ABF2). These were followed by the identification of WRKY1, WRKY2 and WRKY3 from parsley (Petroselinum crispum) and the name WRKY (pronounced ‘worky’) became part of plant sciences. This third paper provided the first evidence that WRKY proteins play roles in regulating plant responses to pathogens, and many reports have since shown this to be a major role of WRKY transcription factors. Increasingly, however, WRKY proteins are being shown to regulate other processes such as abiotic stress responses, seed germination, senescence and wound responses and it is becoming clear that a single WRKY transcription factor might be involved in regulating several seemingly disparate plant processes. The defining feature of WRKY transcription factors is their DNA binding domain. This is called the WRKY domain after the almost invariant WRKY amino acid sequence at the N-terminus. The WRKY domain is about 60 residues in length, and as well as containing the ‘WRKY signature’ it also has an atypical zinc-finger structure at the C-terminus. The zinc-finger structure is either Cx4-5Cx22-23HxH or Cx7Cx23HxC [Figure 1]. In 2005, Yamasaki et al. reported the first solution structure of a WRKY domain. The WRKY domain consists of a four-stranded b-sheet, with the zinc coordinating Cys/His residues forming a zinc-binding pocket. The WRKYGQK residues correspond to the most N-terminal b-strand, which partly protrude from one surface of the protein, thereby enabling access to the major DNA groove and contacts with the DNA. It was proposed that the 5-strand containing the WRKYGQK motif makes contact with an approximately 6-bp region, and this is consistent with the length of the W box, the binding sites of most known WRKY transcription factors. Recently, another major advance was made with the first reporting of the solution structure of a WRKY domain in complex with the W box binding site (Yamasaki et al., 2012). This revealed that a four-stranded B-sheet enters the major groove of the DNA in an atypical mode termed the B-wedge, so called because the sheet is nearly perpendicular to the DNA helical axis. It has long been clear that the conservation of the WRKY domain in WRKY proteins is mirrored by a remarkable conservation of the W box (TTGACC/T). Gel shift experiments, random binding site selection, yeast one-hybrid screens and co-transfection assays performed with many different WRKY proteins have shown that the W box is the minimal consensus required for specific DNA binding. From the beginning of research into WRKY transcription factors, it was evident that they play roles in regulating several different plant processes. Recent data has led to a new insight in this area, namely that it is common for a single WRKY transcription factor to regulate transcriptional reprogramming associated with multiple plant programs. The dynamic web of signaling(Figure 2) in which WRKY factors operate (the WRKY Wide Web!) has multiple inputs and outputs. For over fifteen years, limited evidence has been available suggesting that WRKY TFs may play roles in regulating plant responses to the phytohormone abscisic acid (ABA), notably some WRKY TFs are ABA-inducible repressors of seed germination. However, the roles of WRKY TFs in other aspects of ABA signalling, and the mechanisms involved, have remained unclear. Recent significant progress in ABA research has now placed specific WRKY TFs firmly in ABA-responsive signalling pathways, where they act at multiple levels. In Arabidopsis, WRKY TFs appear to act downstream of at least two ABA receptors: the cytoplasmic PYR/PYL/RCAR-protein phosphatase 2C-ABA complex and the chloroplast envelope located ABAR-ABA complex. 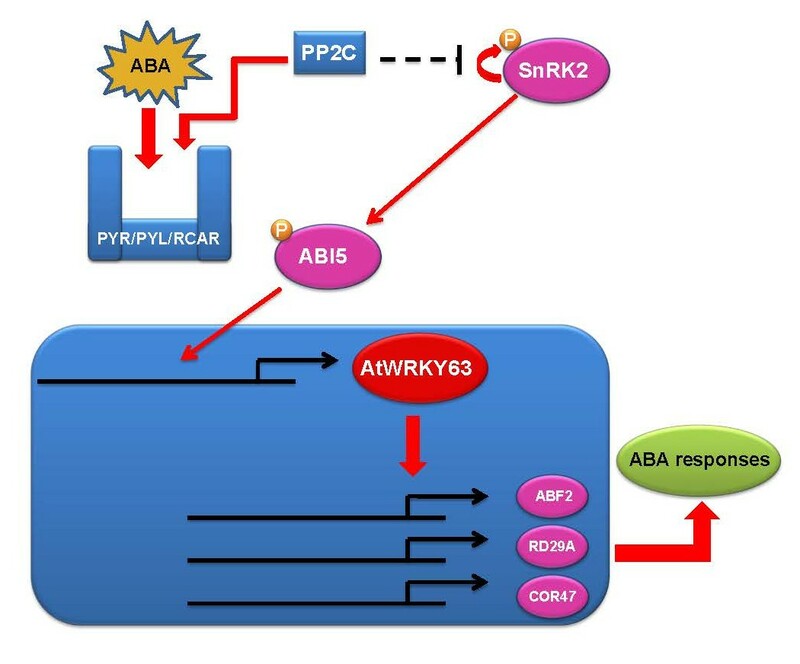 In vivo and in vitro promoter binding studies show that the target genes for WRKY TFs that are involved in ABA signalling include well-known ABA-responsive genes such as ABF2, ABF4, ABI4, ABI5, MYB2, DREB1a, DREB2a and RAB18. Additional well characterized stress-inducible genes such as RD29A and COR47 are also found in signalling pathways downstream of WRKY TFs. These new insights also reveal that some WRKY TFs are positive regulators of ABA-mediated stomatal closure, and hence drought responses. Conversely, many WRKY TFs are negative regulators of seed germination and controlling seed germination appears a common function of a subset of WRKY TFs in flowering plants. Taken together, these new data demonstrate that WRKY TFs are key nodes in ABA-responsive signalling networks (Taken from Rushton et al. 2012). WRKY proteins can activate or repress transcription and substantial evidence now indicates that many genes are repressed by WRKY factors bound to their promoters. The WRKY proteins themselves appear to function via numerous different interacting partners including a diverse array of protein partners, including MAP kinases, MAP kinase kinases, 14-3-3 proteins, calmodulin, histone deacetylases, resistance proteins and other WRKY transcription factors. WRKY genes also exhibit extensive autoregulation and cross-regulation that facilitates transcriptional reprogramming in a dynamic web with built in redundancy (Rushton et al., 2010). The WRKY gene family. A. Neighbor joining phylogenetic tree derived from a MUSCLE alignment of WRKY domains from the complete WRKY gene families from the following species: Arabidopsis thaliana, Glycine max, Brachypodium distachyon, Selaginella moellendorffii, Physcomitrella patens, Chlamydomonas reinhardtii, Chlorella variabilis, Coccomyxa subellipsoidea, Micromonas pusilla, Ostreococcus lucimarinus, Ostreococcus tauri, Volvox carteri, Klebsormidium flaccidum, Bathycoccus prasinos, Dictyostelium discoideum, Polysphondylium pallidum, Dictyostelium fasciculatum, Fonticula alba, Acanthamoeba castellanii, Giardia lamblia, Giardia intestinalis, Dictyostelium purpureum, Auxenochlorella protothecoides, Spironucleus salmonicida, Mucor circinelloides, Rhizopus delemar, Absidia idahoensis, Lichtheimia corymbifera, Rhizophagus irregularis, and Mortierella verticillata. Fungal genes are marked with a red dot, unicellular green algae green, diplomonads blue, amoebozoa black, social amoebae purple, and Klebsormidium flaccidum orange. The higher plant WRKY groups are marked I-III. I NTD and I CTD denote the N-terminal and C-terminal domains from Group I proteins. The tree was produced using MEGA 6. B. Maximum likelihood phylogenetic tree using the same MUSCLE alignment. The availability of increasing numbers of sequenced genomes has necessitated a re-evaluation of the evolution of the WRKY transcription factor family. Modern day plants descended from a charophyte green alga that colonized the land between 430 and 470 million years ago. The first charophyte genome sequence from Klebsormidium flaccidum filled a gap in the available genome sequences in the plant kingdom between unicellular green algae that typically have 1-3 WRKY genes and mosses that contain 30-40. WRKY genes have been previously found in non-plant species but their occurrence has been difficult to explain. We have performed searches for WRKY genes in available genome sequences. Only two WRKY genes are present in the Klebsormidium flaccidum genome and the presence of a Group IIb gene was unexpected because it had previously been thought that Group IIb WRKY genes first appeared in mosses. We found WRKY transcription factor genes outside of the plant lineage in some diplomonads, social amoebae, fungi incertae sedis, and amoebozoa. This patchy distribution suggests that lateral gene transfer is responsible. These lateral gene transfer events appear to pre-date the formation of the WRKY groups in flowering plants. Flowering plants also contain proteins with domains typical for both resistance (R) proteins and WRKY transcription factors. R protein-WRKY genes have evolved numerous times in flowering plants, each type being restricted to specific flowering plant lineages. These chimeric proteins contain not only novel combinations of protein domains but also novel combinations and numbers of WRKY domains. Once formed, R protein-WRKY genes may combine different components of signalling pathways that may either create new diversity in signalling or accelerate signalling by short circuiting signalling pathways. “IIa+b Separate Hypothesis sees Groups IIa and IIb evolving directly from a single domain algal gene separate from the Group I-derived lineage. 1) Charles I. Rinerson, Roel C. Rabara, Prateek Tripathi Qingxi J Shen, and Paul J. Rushton (2015) Structure and evolution of WRKY transcription factors. In Plant Transcription Factors: Evolutionary, Structural and Functional Aspects Edited by: Daniel H. Gonzalez. Elsevier. In the press. 2) Charles I. Rinerson, Roel C. Rabara, Prateek Tripathi Qingxi J Shen, and Paul J. Rushton. The evolution of WRKY transcription factors. In review.